The J/22 is a fast, early planing 22 foot keel boat, which requires all skills from helmsman and crew to get around the cans but returns enormous pleasure, excitement and speed in all weather conditions. Even a day cruiser wants to be fast on the water. the J/22 combines its speed potential with a large cabin enough to accommodate two persons and stores for a one week holiday. the hull is designed for dry sailing, with traditional sheer, a higher bow and plenty of flare to keep the waves off the deck.The safety of the J/22 is guaranteed by two fixed buoyancy tanks, which makes the boat unsinkable, and a large self bailing cockpit. The strict one design rules, governed by the International and National J/22 Class Associations, provides the competitors with equal boats for fair one design racing. One of the main objectives in the class rules is to reduce the costs of racing. The use of expensive equipment or exotic material is banned from the class. The J22 was designed in the United States by Rod Johnstone in 1982. Since then over 1500 boats have been built. In the United States the largest fleets can be found, distributed all over the lakes and coasts of the country. Further smaller fleets are in Canada, Jamaica, Cayman Islands, Italy, Germany, Belgium and South Africa. The largest fleet in Europe can be found in The Netherlands, with over a 100 boats at the moment. In 1993 the class was officially recognized as an international one design class by the IYRU. In 1994 the IYRU women world sailing Championships in La Rochelle, France, were sailed in J/22s. In 1998 The J/22 was used at the ISAF Worlds in Dubai. Value for Money – What do you get? This all wrapped in a blistering (“Gleaming”) white hull, topped with white spars and Harken deck hardware as standard.Due to the strict class rules and the solid construction of the hull, spars and equipment, the J/22 is low budget to sail. The expenses on equipment or sails to be competitive are low. The build and finishing quality of the J/22 guarantees a long life for boat and equipment, and reducing the maintenance costs. This also contributes to a high return on investment. 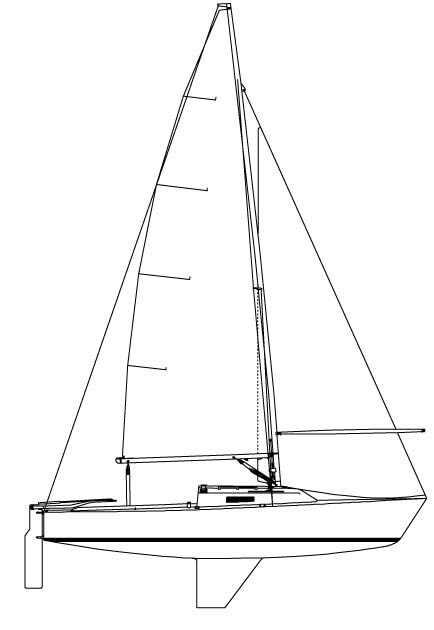 The wide midship beam combined with a narrow fin keel provide excellent stability upwind. The flat aft under water shape gives a perfect planing area. The sheer and bow lines give a good performance sailing in waves. the hull combined with an amble mainsail, a sensibly sized jib, a big spinnaker and light weight of 857 kgs gives a keelboat which responds like a ballerina. The sensitivity to windward is excellent, the helmsman gets all the pleasure of sailing a very responsive boat. The oversized spinnaker helps to plane the J/22 in a 12 knot wind. When it really starts blowing, the three sail reaching capabilities of the J/22 starts one of life’s most heart-beating experiences. The J/22 is also convenient for day, weekend or holiday cruising. The cabin provides plenty of stores and the area forward of the mast can be used as a V berth. The pleasure of cruising with a J/22 is being faster than many 30 footers on the water, always being able to find a free slot in the wind.